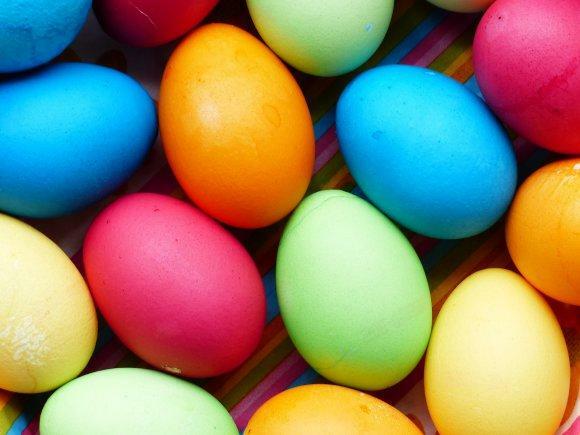 Whether you say “Happy Easter” or “Frohe Ostern” the tradition of dying Easter eggs is a cultural similarity. Courtesy photo. GRAFENWOEHR, Germany — When it comes to celebrations in Germany, colorfully decorated trees aren’t just for Christmas anymore. Roughly four weeks before Easter — which falls on April 1, 2018 — handcrafted eggs dangle from the branches of birch trees, symbolizing new life and fertility, and towns, big and small, are painted in a sea of pastel. Public fountains are adorned elaborate greenery, garland and florid Easter eggs to welcome the spring season and offer thanks for life-giving water. Each town seeks to make its decorations bigger and brighter than the next, and one local village, Sulzbach-Rosenberg, still holds bragging rights. In 2005, this small town just 18 kilometers south of Vilseck entered the Guinness Book of World Records for the most eggs used to decorate an “Osterbrunnen,” or Easter fountain. The townspeople managed to hang a total of 16,500 eggs, beating out the previous record of 11,600 held by Baden-Wuerttemberg. While the ornamentation comes early, the official Easter holiday in Germany begins on Gruendonnerstag (Maudy Thursday). Gruendonnerstag means “Green Thursday” and is believed to be the day on which the Last Supper was held. It is tradition to clean your house thoroughly on this day, a custom possibly linked to the preparation of a Passover Feast. Green food, such as spinach, kale, cress, leek, chives and other herbs are traditionally eaten on this day. In both cultures, Good Friday is a day when Christians reflect on the crucifixion of Christ. In Germany, the day is known as both Karfreitag meaning “sorrowful Friday” and Stiller Freitag, or quiet Friday. Unlike the U.S., Good Friday, along with Ostermontag (Easter Monday) are national holidays in Germany. While there are apparent differences, many other German and American traditions overlap throughout the four-day celebration. Easter eggs are dyed and children anticipate a visit from the “Osterhase” or Easter Bunny. Ostersonntag (Easter Sunday) brings church services, family gatherings complete with culinary overindulgence, rousing Easter egg hunts and baskets filled to the brim with chocolate and candy. Germany stands alone, however, when it comes to the Saturday night bonfire (a symbol for the sun as the giver of life), and the baking of a braided sweet bread in the shape of a wreath, (Osterbrot), which is found in German bakeries around the holiday. But America holds her head high as the birthplace of the infamous chick-shaped marshmallow treat; because nothing says “Happy Easter” or “Frohe Ostern” quite like a candy Peep.